The department: / The Older People’s Mental Health Services South of Tyne have undergone major review and reform. There are a number of Community Mental health Teams (CMHT’s) clusters; an integrated Memory Protection service; functional illness and organic illness care streams; specialist liaison service; and continuing care wards. Consultant job plans have changed to reflect the service changes. There has been a move towards a New Ways of Working (NWW) approach in the consultants’ job plans with consultants working in focused sub specialist roles. The clinical role is predominantly an inpatient role working in an organic inpatient unit, Roker ward alongside another junior doctor.Roker is a 12 bedded male inpatient ward assessing and treating older people with organic Illnesses often combined with complex problems and needs. The ward uses a bio-psycho-social model to inform its culture and approach to patients.The post holder will work closely with a core trainee working at female organic inpatient assessment ward. The cross cover is provided by the other trainee at female assessment unit. The post holder will also work in community mental health team for one day a week. Overall, this post will offer very good opportunities to enhance knowledge of mental health problems in older people and their management. The Clinical Supervisors will be Dr Van Zyl in community and Dr Muhammad Asif in the inpatient ward. There are also two psychiatry trainees and an F1 doctor working onto the two dementia assessment wards at Monkwearmouth Hospital who may provide peer support and cross cover when required. The core role of the trainee will be in the inpatient assessment and management of older patients with a range of complex mental health needs. There will also be a chance to be involved in the medical student teaching. There is an active teaching programme for trainees. The type of work to expect and learning opportunities: / Foundation Trainees (FT) are expected to develop their confidence in clerking new admissions and then coming up with appropriate differential diagnoses, a management plan and then implementing this. There are ample opportunities to complete the key FP learning outcomes and you are encouraged to undertake regular WBPA’s. You may also have exposure to outpatient clinics to learn more about chronic disease management.This would be within the memory assessment and management service and would involve the assessment and management of patients with dementia. Become life-long learners and teachers. 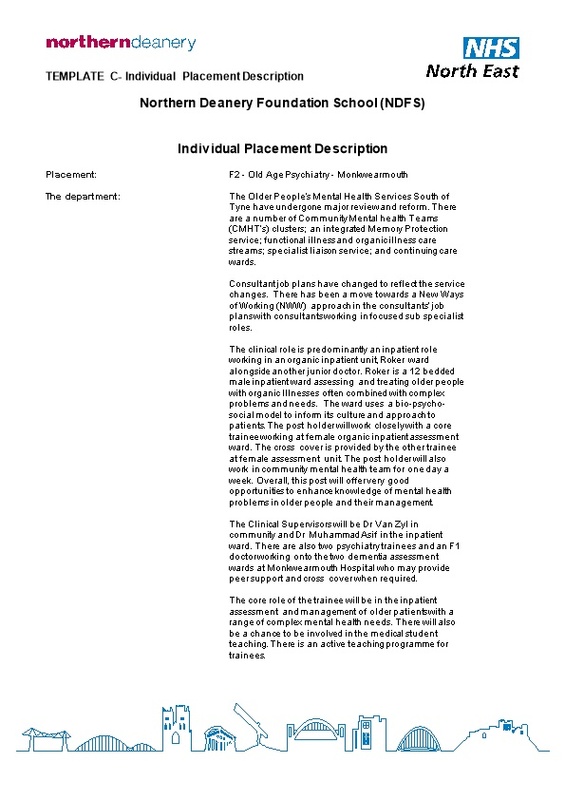 Where the placement is based: / Monkwearmouth Hospital: Roker ward and Community mental health team offices. Main duties of the placement / FTs are expected to work as part of the multi-disciplinary team to develop and deliver management plans for each patient with the support of the senior doctors on the ward. This will involve the skills described above which will also be developed in the process. FTs are expected to attend and participate in the structured teaching programmes provided in the department. The postgraduate programme takes place on a Thursday morning and involves journal club presentations, case conferences and expert speakers. There is also psychotherapy teaching on a Tuesday morning that trainees are encouraged to attend. There is also a morning of communication skills training once every six months.FT will also be responsible for such other specific clinical duties as allocated by consultants including performing other dutiesin occasional emergencies and unforeseen circumstances. Typical working pattern in this placement / The standard working day will be 9am to 5pm. The anticipated on call commitments (currently under review) may be a 1 in 15 hybrid pattern with 1B banding. Medical cover to the Mowbray ward, Marsden ward at Monkwearmouth Hospital, may be required at times. Training, supervision and study leave / One hour a week of supervision will be provided when both the trainee and supervisor are available. The trainee will be able to attend the Foundation Teaching Programme at the acute trust. Appropriate study leave will be allowed as long as the service is adequately covered. It is important to note that this description is a typical example of your placement and may be subject to change.